However, something I realized, sorting out the cosplays I particularly liked, is there are 2 things I value if I did cosplay--to look like the character, but also, to also be kind of like the character---if they were me. Sort of like capturing the "ethos" of the character, translated into the modern day me. For example: An hours worth of make up on Princess Leia? Totally. Princesses have to keep up appearances. Princesses need to be careful how they dress, how they walk, how they look. So a princess would totally spend a lot of time on make up. Yes, Princess Leia is cool and independent. So that means she puts on her own makeup, and doesn't drag along a make-up assistant before battles. She's still a princess, you know. So if I was pretending to be Princess Leia, then yes, I'd put on make up. 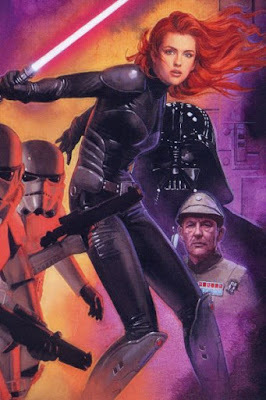 More than a minute's worth of makeup on Mara Jade? Think about it. Her idea of looking presentable when Luke was coming, was to wash her face in an icy creek when she hadn't had a shower in 2 weeks. (Specter of the Past). If Mara used make-up at all, she probably wouldn't put on any more than took 60 seconds....unless she was impersonating a duchess or something like in Allegiance. But most of her work seemed to be of the hijacking pirate ships and leaping over roof-struts to rescue hostages type of things. I like this picture of her I found on the internet. Red gold hair on a blazingly idealistic 18 yr old. That said, I think when I do get round to making Josh a Grand Admiral Uniform, we will go the whole 9 yards with the blue skin and red eyes and all, because Josh basically is Thrawn already. (minus the superhuman IQ. And Josh is a Christian. And a sort of imperialist libertarian. So not the totalitarian part either.) But when we do give Josh blue skin, we will do it authentically. So I will feed him colloidal silver, to turn his skin bluish-grey naturally. When trying to be like Tolkien's characters, I feel like it somehow isn't really the ethos of the Elves of Middle Earth to be wearing lots of make-up or wigs. To me, Tolkien's world is about the natural beauty of things, the grain of the wood, the rustle of leaves, the tangle of rocks and trees and stars, elven maidens clad in simple dresses, water bubbling over rocks from a mountain brook. (As much as I love the complicated velvet gowns of the movies, they don't seem to really match the people in the book). When cosplaying Lord of the Rings characters, I like it when cosplayers just showcase the beauty of their natural hair (even forgoing their "usual" modern hair products, straighteners, curling irons, etc) go light on the make-up, and leave the artificial wigs alone. 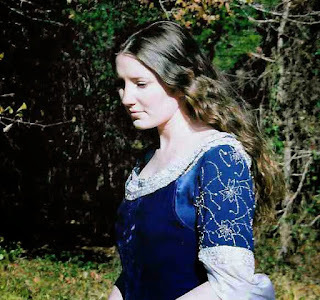 To me, a brunette Eowyn or a blonde Arwen is so much more "authentic" than one with a wig. And an Arwen or an Eowyn climbing a tree or making breakfast feels more "authentic" to me than one at a convention playing dress up (which I imagine would be very very fun, hanging out with like-minded people, and I would love to do some day. However, it's not capturing the "ethos" of the elves). this cosplayer "Mela"dress made by "Gen", captures more of the "ethos" of the elves for me than any of the elves in the movies did with their make up artists and fake trees. I prefer dark haired Eowyns to Eowyns with yellow wigs. (Practically, because you have to drop a good bit of money into a blonde wig for it not to look fake.) But also, I don't think Middle Earthers wore wigs, at least, not the rough-and-tumble early-medieval-Saxon-esque people of Rohan, living in wattle & daub halls (maybe flax or hair extensions, but definitely not wigs. That would be Roman). The older 3 had a lot of fun painting a picture. A picture. I spent the whole time laughing and taking pictures. (And yes, Jenny fixed her own hair) Here is a sampling. Now I'm either going to sell it for millions ("the individual & community----the struggle to express autonomy realized in the clashing colored lines...), or just give it to an appreciative aunt. The kids enjoyed their reading time. They were reading books by their great-uncle, "Hamster Holmes" a series about a detective Hamster and his firefly sidekick "Dr. Watt" who speaks via morse code. Isaiah got very excited and quoted bits of it over and over. The others shared in his joy. Isaiah's meltdowns kind of dampen the whole mood in the house, but the flip side is his fits of joy can be quite contagious. I wish I could credit my great homeschooling plans and tell you he was actually reading it to them, but he's not reading yet, just drawing on his very impressive memory. After watching a huge crane move a house's airconditioner up over the house and onto the truck, he decided it needed to reverse the process, "He wants to put the box back! He wants to put the box back!" As we dragged him into the house, he collapsed onto the carport floor. "Isaiah, get off the carport floor" Grandma said. In all seriousness, he answered "I can't, I'm dead"
Later, on grabbing his beloved blaster from Kuzzles and shoving a girly toy at her as a replacement (Kuzzles wasn't buying it) "She wants the pink toy!!" he insisted, holding onto the blaster. Isaiah doesn't need as much sleep as the girls do anymore, and now gets to go to the "brothers room" as he calls it. One of his favorite Bible videos is about Joseph, which he calls "Joseph AND HIS BROTHERS" when referring to it. He is very excited about a room belonging to "the brothers", except he hasn't got a brother yet. Once he was pretending to be Joseph, wrestling against imaginary adversaries pulling off his coat "And they took off Joseph's coat!" when Jenny came up to me, and said reassuringly "We don't have other brothers." So Isaiah isn't going to be tossed down a well anytime soon. He mostly wants to sit in Josh's lap, and give him directions how to play Star Wars Battlefront II. "Now I want to be the green stormtrooper!" (color coded clone troopers). Our evenings are more exciting now, punctuated with exclamations of joy such as "we kill the evil robots!" Isaiah was very excited to help with the dishes. Evidently you can clean almost anything with soapy water and an egg beater. He spent 10 minutes beating the soapy water with the egg beater while proclaiming "Isaiah is helping Mommy with the dishes!" He was very pleased. He loves play acting bits of movies, often quoting 10 minutes worth of dialogue. He is excellent at mimicking intonation, and memorizing words he does not know the meanings of. Nothing thrills him more than when you join in. The other day, he pointed his little toy blaster at me, and pretended to be Agent Kallus confronting Ezra "Its over for you Jedi. A master and an apprentice. Such a rare find these days." I said "I don't know where you get your ideas, Buckethead, I work alone." He smiled encouragingly at me, and corrected "delusions." Jenny told me last week "Mommy, when you grow up, you will be a Grandmommy." Because of her little "Baby Isaiah" stuffed hippo, she calls herself the "Mommy Hippopotamus", so I get to be the "Grandmommy Hippopotamus" a term she bestows on me as a sign of affection and good will. We've been working on gentleness and not hurting other people and sin and all that. (prayers appreciated!). I tried to explain to her that it makes God sad when we hurt littler & weaker people. Then I told her it makes God happy when we be kind to littler & weaker people. Jenny gently stroked Mariam's head, and then exuberantly rocketed down the hall, proclaiming "GOD IS HAPPY!!" "no no no no no!" Also, "Daddy--daddy-dadddy" in a mournful tone, pushing up a chair and climbing it to look out at the driveway where he was last seen, leaving for work. Throughout the day, she will sometimes shout "Daddy" towards the driveway, in faith that he is hiding just out of site. Then when he returns from work, its "DADDY-DADDY-DADDY!" running into his arms. Isaiah was make-believing with Jenny. They were pretending the rocks were food in their little flower pot. They kept bringing rocks over to me to have me pretend to eat, and comment on how tasty they were. A typical scene from our lives. Josh is home from work, trying to read "Fox in Socks" to an appreciative but somewhat active audience. Just imagine all of them trying to climb onto his back and those are the pictures I missed, because Josh found out I was taking pictures, making true family moments artificial, etc, etc. This year, I had a baby in September. So I forwent the Ithilien Family Idea (Josh as Faramir Ranger, me as Eowyn, the kids as either little Rangers or Shieldmaidens), and the Star Wars plans (Josh as an Imperial from the Empire of the Hand, Isaiah as a Stormtrooper or Luke, Jenny as Mara Jade or Princess Leia, little ones as droids), and had Josh's mom and sister do most of it this year. So we had a Fairy Princess, or a "Fawwy Pwincess Buttuhfly" as she called herself. I think she stole a few hearts, saying "twickohtweet" or "Thankyou" at the doors intermittently. Alas, this is the little grimace she trots out whenever you ask for a smile. She is, in fact, saying "CHEESE!" And a little cat. She matched her Aunt, also a cat. She drank a bottle during the trick or treating, prompting one candy-giver to request seeing her teeth as proof of her ability to consume the candy, before putting a handful into her little purple bucket. It was pretty cute. And a Stormtrooper. Although he went against protocol, and took his helmet/mask off for the duration of the adventure. So I guess we can all assume he lives to the end of the episode. Which he did. And then ate so much candy his mouth was blue. And a last minute Princess Leia who, due to clothing constraints of what was white, is sort of a praire-school-teacher version of Princess Leia. Which was cool enough it made me which I had a six-shooter in lieu of a blaster. A Space Western, you know. This Alas, is the only group shot. Josh, as you can see, went as "Josh." He was probably the most convincing of all of us. And the crowning glory, was the "Queen of Cheese." So named because of her habit of producing prodigious amounts of cheese, to rival the title of her elder brother who held the position of "President of the Cheese Club" for the duration of his infancy. Aunt Cathy came up with the concept for the Queen of Cheese, and made the costume. Just as we were returning, a car pulled up in the dark, and a woman held out a bag toward us saying "This is for you!" I hung back, with brief thoughts of horse heads and strange mafia and voodoo stuff fleeting though my head, before we realized it was our neighbor, giving a baby gift for Mariam. It was an abundance of beautiful handmade burp cloths, a tribute which the Queen of Cheese readily accepts. Much candy was consumed, and Isaiah even flattered me by having a little meltdown when I changed out of my Princess Leia costume. "Mommy! 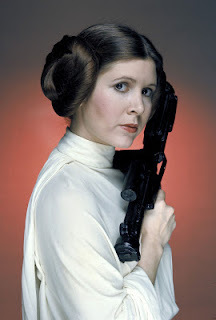 Be Princess Leia!"